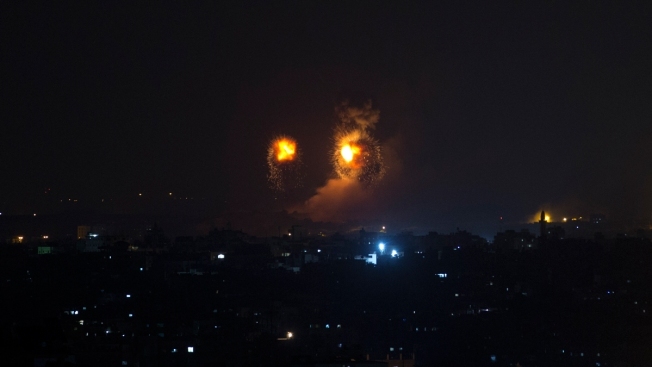 Fire balls caused by Israeli airstrikes on Gaza City, early Thursday, Aug. 9, 2018. Israel struck targets in the Gaza Strip after dozens of rockets were launched Wednesday from the coastal territory ruled by the Islamic militant Hamas group, the Israeli military said. Israeli warplanes struck dozens of targets in the Gaza Strip and three people were reported killed there, while Palestinian militants from the territory fired scores of rockets into Israel in a fierce burst of violence overnight and into Thursday morning. Israeli Cabinet minister for construction and housing, Yoav Galant, said that "whatever is needed to be done to defend our civilians and soldiers, will be done, no matter what would be the price in Gaza." Associated Press writers Mohammad Daraghmeh and Fares Akram contributed to this report.